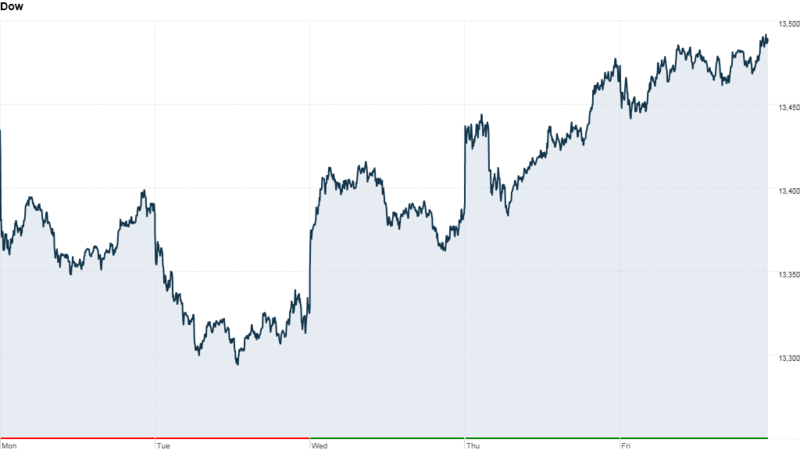 U.S. stocks finished little changed Friday, a day after the S&P 500 closed at a 5-year high, as investors digested earnings from Wells Fargo and a fresh batch of economic data. The Dow Jones industrial average and Nasdaq rose 0.1%, while the S&P 500 shed less than 1 point. Wells Fargo (WFC), the first major bank to report quarterly results, posted a quarterly profit that beat Wall Street's expectations and sales that were roughly in line with forecasts. The results showed signs the mortgage refinance boom, which has been fueling bank profits, may be coming to an end as interest rates begin to rise. Wells Fargo's stock declined almost 2%. Shares of Bank of America (BAC), JPMorgan Chase (JPM), Citigroup (C), Goldman Sachs (GS) and Morgan Stanley (MS), which are all on tap to report next week, also lost ground. The financial sector is expected to be the standout performer in an otherwise lackluster quarter for earnings growth. S&P 500 companies are expected to report overall earnings growth of 2.4% for the last three months of 2012, according to FactSet Research. That's better than the 1% decline in the third quarter. But excluding the financial sector, earnings growth for S&P 500 companies is expected to be just 0.2%. On the economic front, the Bureau of Labor Statistics reported that export prices fell 0.1% in December. The Census Bureau said the U.S. trade deficit widened much more sharply than expected -- 16% -- due to a rise in consumer goods brought in from overseas. Poll: Is Herblife a pyramid scheme? The wider-than-expected deficit could signal a sharp slowdown in U.S. economic growth for the fourth quarter, after a 3.1% uptick in the third quarter, said Marc Chandler, global head of currency strategy at Brown Brothers Harriman. The first estimate for fourth-quarter GDP is due later this month. Meanwhile, there was more bad news for Boeing (BA) as All Nippon Airways reported an oil leak was discovered from the generator in the left engine of a 787 Dreamliner, adding to the recent troubles for that key aircraft. Boeing shares slid 2.5%, making it the biggest drag on the Dow. Related: Boeing 787: The biggest lemon in history? Shares of American Express (AXP) moved higher after the credit card giant announced late Thursday that it was cutting 5,400 jobs, becoming the latest large financial firm to reduce its headcount. Ford Motor reported it plans to hire 2,200 salaried staff this year, the largest addition of white collar workers in more than a decade, due to aggressive product introduction plans. Shares of Ford (F) rose 1.2%. 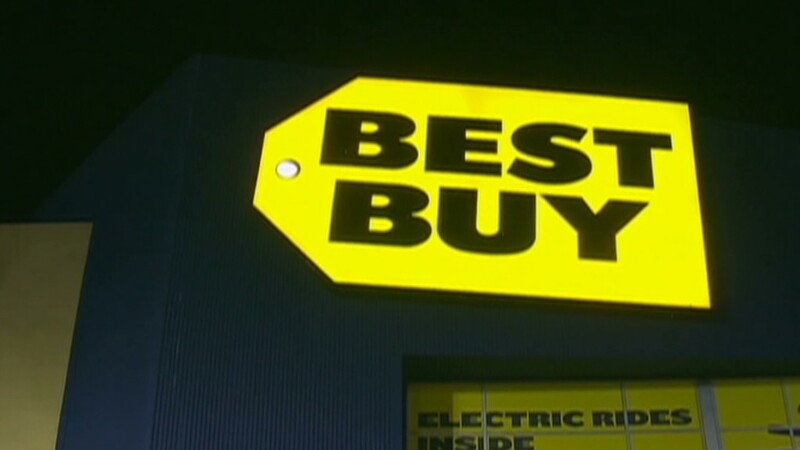 Shares of Best Buy (BBY) jumped more than 16% after reporting dismal holiday sales that nevertheless beat Wall Street's expectations. The company's sales at stores open at least a year fell by 1.4% in December, with flat sales in the United States. JC Penney (JCP) shares tumbled after UBS analysts said the retailer's holiday sales will be worse than expected and downgraded the stock. Best Buy sales flat. That's good news? European markets were mixed in afternoon. ECB President Mario Draghi said Thursday that the central bank was seeing signs of stability returning to the eurozone, although the near term outlook for the economy remained weak. Asian markets ended mixed, with the Nikkei adding 1.4%, after Japan's government unveiled a $117 billion fiscal stimulus package. Unable to match the Nikkei's momentum, the Shanghai Composite declined 1.8% and the Hang Seng lost 0.4%. The dollar was weaker against the euro, as the ECB's unanimous decision to hold rates ended talk of a cut in the short term. The greenback gained versus the British pound and the Japenese yen. Oil and gold prices edged lower. The price on the 10-year Treasury rose, pushing the yield down to 1.87% from 1.89% late Thursday.